inflates around the entire arm to avoid incorrect cuff positioning helping to ensure a precise reading. Cuff fits arm circumferences from 9" to 17”. 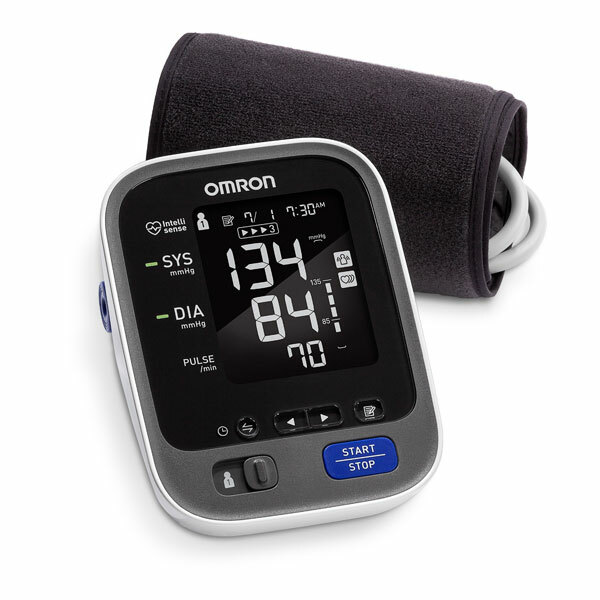 The Omron 10 Series® Wireless Bluetooth home blood pressure monitor (BP786N) has all the features of our 10 Series monitor and more. Now you can access your readings anywhere, anytime with our free Omron Connect app that wirelessly connects to select Apple and Android device. Featuring graphs & trend charts to view your current and prior readings at a glance, or in a list view. Also, allows you to email out and share your readings, and offers connectivity to the Apple Health app. Using the Omron Connect app makes it easier for you to track your progress and take the right steps to manage your heart. 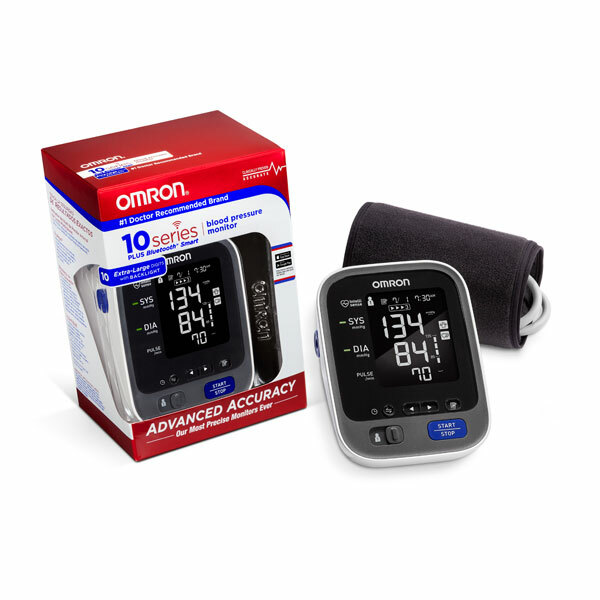 The 10 Series Wireless upper arm blood pressure monitor Easy-Wrap ComFit cuff that will fit arms 9 to 17 inches in circumference as well as Omron TruRead Technology that takes 3 consecutive readings and calculates the average for a more accurate picture of your heart’s health. The 10 Series Wireless also saves readings for 2 users up to 100 readings each and an easy-to-read backlight screen with extra-large digits and multi-colored indicator lights for easy to understand measurements and readings. 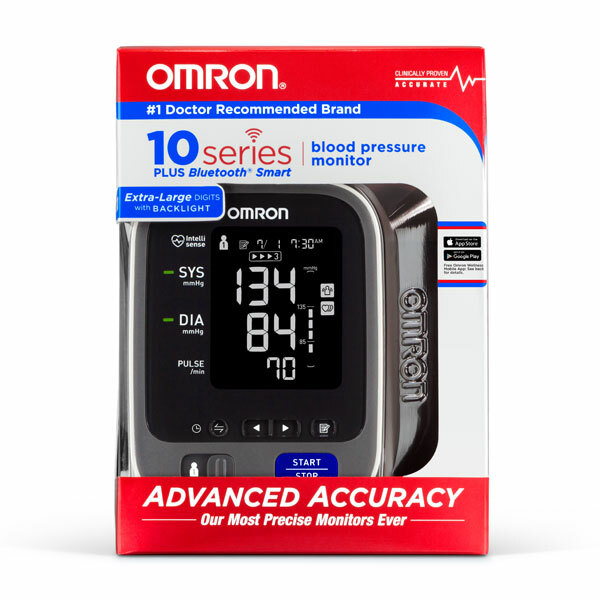 When you trust your heart to Omron, you’ll be empowered by accuracy. Your BP786N Automatic Blood Pressure Monitor, excluding the arm cuff and battery, is warranted to be free from defects in materials and workmanship appearing within 5 years from the date of purchase, when used in accordance with the instructions provided with the monitor. The arm cuff is warranted to be free from defects in materials and workmanship appearing within 1 year from the date of purchase when the monitor is used in accordance with the instructions provided with the monitor. The above warranty extends only to the original retail purchaser. We will, at our option, replace without charge any monitor or arm cuff covered by the above warranty. Replacement is our only responsibility and your only remedy under the above warranty.